What game did you play most in September? Not bad. A couple of great two-player games of D-Day Dice and some solo. A weekend away means a lot of Poker. And LotR Risk. Not a bad variant! New Game of the Month: Kolejka. That was great fun! And a beautiful game as well. September was a bit below my monthly average for the year, but with 28 plays still almost came out to one play per day. No new "full" games this month but the brand new Colonization expansion for High Frontier did arrive last week - just in time for some solo plays to learn how to use all the cool new things. There will be many more plays of that in October and beyond. I was glad to get Clash of Cultures out twice this month, plus a few other favorites got played along with a whole bunch of kids' games with my daughter who just turned 4 years old a few days ago. Kind of a slower gaming month. 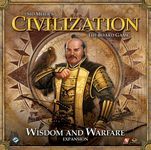 But not only did I get to play Sid Meier's Civ twice this month, but both plays used the extremely awesome Wisdom and Warfare expansion. 24 plays of 19 different games. Games in bold are new to me. 22 plays over 12 games. Bolded ones are new to me. Roll Through the Ages is just such a simple and accessible game that it fit our schedule more than anything this month. A few of the plays are actually solo plays too, as that is something I can do in less than 10 minutes if I've got a bit of time to kill. I have only been logging plays for the last few months so I'm not sure what will be standard, but I think if I hit 20 plays per month then I'll be happy. Next couple months are going to be busy so we'll see how it goes! A very light month for me: at 53 plays, I'm at the lowest point since May 2009. We've been on a lot of weekend trips and doing some preparation for our upcoming baby (due March 1, at which point I don't expect to play more than like 4 games a month, because there will be far more important things to do). A four-way tie for most-played this month, but timewise, Space Cadets wins hands down. This co-op game feels quite unlike others in that each person has a completely unique role that still has to work in tandem with the others. A bit rulesy, but worth it. Other tied titles: new-to-me deduction thriller Noir, light chaotic race Master Plan, and intriguing abstract TZAAR. 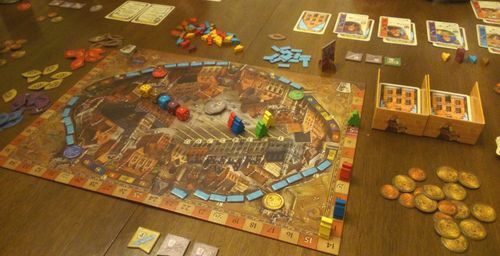 Bruges was new and easily climbed to the top of our most played list for September. Castles of Burgundy, another Feld, continues to see a steady number of plays as our most played game over the last year. Troyes was given another try and clicked for my wife, this time yielding a boost in its plays this month (yeah!). 23 plays across 10 games. 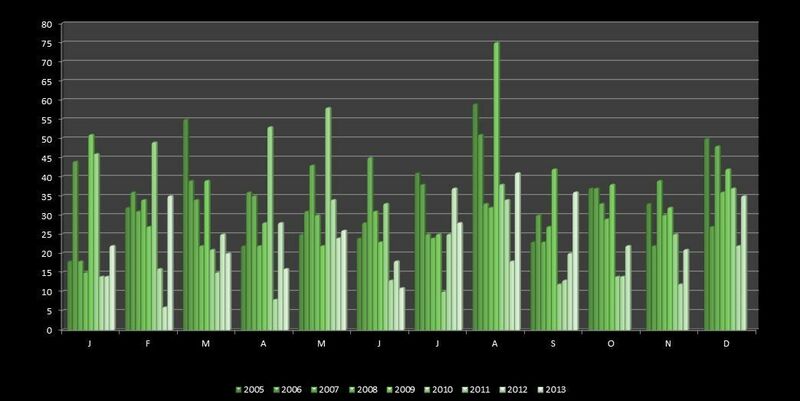 The quietest month for years. 13 plays of 12 different games. 14 total plays, a little low since I've gotten going earlier in the year, but there was no gaming for the first third of the month. Italicized entries were new to me this month. September turned out to be a decent gaming month for me. Considering how busy I was, I'm happy with the amount of games I've played. September was a much quieter month than August, as we were back from holidays and work was beginning to kick in. I took on some more things, and my other half needed to prepare for a course, so the gaming was put just a little to the side. It is always on the agenda, though, and maybe we just need to make sure that there is always something quick on hand to play. 11 plays of 5 different games. San Juan – 3 games, 13 this year, total 29. I ended August's losing run with two wins on the trot before my SO got back into gear, and it is amazing how one's opinion of a game can improve even after a short winning streak. I still have the nagging feeling, though, that this is a game which needs to stretch its legs, so maybe it really is time to track down the Treasure Chest expansion. Even so, I just cannot convince myself that it is worth getting all those other expansions I will never use. I also was reminded, quite by chance, that there is a drafting variant in the rules. Nearly thirty games in, I think we are sufficiently acquainted with this one to begin adopting this idea. Machiavelli – 3 games, 27 this year, total 27. A weekend away with my mother and stepfather, and it was almost inevitable that this one would hit the table. This Italian variant of Rummy is a real brain burner, and there was a fair amount of AP going on, trash talk too. In the end my SO won two and I won one. All those other board games have clearly been sharpening our competitive edge. Forbidden Island – 3 games, 3 this year, total 13. We realised earlier this year that we had been playing this game wrong all along by not removing the flood cards for disappeared tiles from the deck. Suddenly our go-to comfort game (because we could both win fairly easily and feel good about it) has lost its cuddliness, and our decisions have become much more important. We lost our first game on the Normal level, feeling that the luck of the the deck was against us, also that our roles were not particularly great, but then coasted to a win on the Novice level and felt a little better. Is it just me or is this game a little tough in two if you draw the wrong roles? Maybe the next time it comes out of the rotation it might be worth considering the alternating-two-roles-each variant. 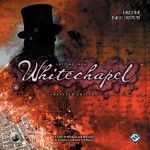 Mystery Rummy: Jack The Ripper – 1 game, 13 this year, total 20. Every time we come back to this game we find that we have to learn it from scratch. It does get a little easier in each rotation, but the rules are laid out in a very strange manner and could be much more clearly articulated. Thankfully there is usually enough information on the cards to allow play to progress smoothly enough, but the “only ever one Alibi card in play” rule nearly caught us out yet again. For all that though, this is a great little game once we have got back into the flow of it, and can lead to some really tight decisions once we know what is going on. I am a little sad that it was rotated out after only a single play, but there are other games I need to get through, and this will undoubtedly be back. Magnum Sal – 1 game, NEW TO US. Acquired this in a maths trade early in the year, we eventually got it to the table this month, making this our first new game since April, given my slow down on the whole buying thing this year. As early as the first phase of our very first game (2P, as always) I felt that there was not enough in terms of choice or pressure. It is an easy going Euro with plenty of space for decisions, some nice toing and froing in terms of paying other workers to transport your salt, but I never felt that my decisions made a really critical difference, neither that the tempo of the game changed significantly as the phases wore on. It is a solid game, though, well designed and with a nicely integrated theme, but I do not feel that it really deserves to stay in our collection. I was hoping that the game might reveal itself in the second and third phases, after the resets of the board (miners going home for the weekend, presumably), but even with the gradual descent to the bottom level of the mine, this fell rather flat and I felt that the last phase was the same as the first, just with more expensive salt and a deeper mine. Perhaps with more valuable tools becoming available later in the game, or options opening up only later, a la Agricola, this might have moved me more, but I left my first play a little downhearted, especially as a read through the rules had promised something charming and quirky. In terms of its mood and feel it has been compared to Stone Age, and I see the links, but I find that game much more interesting, the components and colours much more engaging, and, as far as games with an economic slant go, Pret-a-Porter knocks it into a cocked hat. Earlier in my gaming career and with a more scattergun collection I might have liked this game a lot more, but with my pile of games the way it is there is always something I would prefer to play and it does not do enough differently to justify its place. I like to give games second and third chances where possible, but those games need to hold the promise of something missed. Here I really felt I'd seen it all first time through, and, if I am wrong, I am happy to let somebody else find out at some point. This has already gone to auction. Hopefully we'll get more gaming done in October. September is always front-loaded with work for me, and I am hoping to clear the decks before too long. 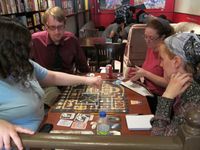 As always, it is going to be a case of adapting our gaming to suit our environment, and if that means fewer long sessions and more quick plays for the time being, then so be it. I have been manoeuvring our collection gently towards shorter games for a while, as I think these suit us better, so let's see how we go. 104 plays in September! The long downward spiral that had been pulling me into an abyss has been broken. Yeah! 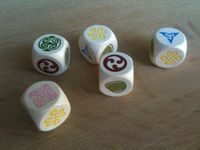 The list is topped by my own new design (together with Reinhold Wittig), a silly, fun dexterity game. Another good newcomer was Playmobil Soccer Match, which I won in a sweepstake. 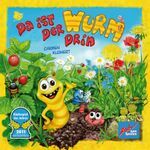 And I tried out various new Amigo releases which I am to present in Essen. Best of those was Word on the Street. 34 plays of 10 games. Bold indicates a new game for me. Red indicates a game not played in at least one year. 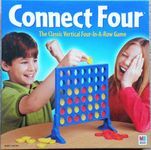 All of the Connect Four games were with my 10 year old daughter. OK, so September 2013 just tied October 2012 for least games played in a month since I started logging plays on BGG. In fact 9 out of 11 of these games were played on the first 2 days of the month (thanks to Labor Day weekend.) Once again life gets in the way. I came down with a nasty cold/sinus infection which messed up our plans for 1 weekend, Rikki has been buried at work so she's been working extra hours, and when we got together with friends we had to spend time planning youth activities instead of playing around. Nothing you can really do about that, at least our priorities are in the right place. Plus the few games we did play were all a lot of fun, so I can't complain. Now October is my birthday month, so I have plans to make this a big month of gaming. We'll see how it goes. As for most played in September, well there's only one that we played 2 times, which is one of the games Rikki has really become hooked on. One fewer play than last month, as this game is now a standing social engagement. This month's decks were the devastating Slurping Darkness (Cthulhu/Yog ladies' auxiliary), a stout Agency monofaction Stinkin' Badges, the fun-to-play but ultimately uncompetitive Delerium Tremendous (Miskatonic/Shub built around the neutral Drunken Hallucinations event), and Blackest Market (Silver Twilight deploying Syndicate thieves and fences). Five more plays than last month for this quick, portable, greatly replayable game, which is one of my daughter's favorites. This was an opportunistic clearance purchase that turned into a really pleasant surprise. It seems destined to a place of preference among my family games. This dice filler was a much less impressive acquisition, and with two players it verges on boredom; but I'll still have to play it a little more to give it a fair shake. Some especially good games of this one, including my daughter's first-ever win. A slow month. Low number of plays (except the usual amount of railroad games), nearly no new games. 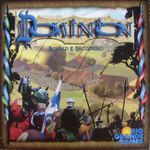 Now that my son has started to play Dominion, it's getting a lot of play time. Not so many games, but a lot of first plays of bigger games. Vasco da Gama	1 Like it! More single plays this month than usual. Most likely due to Buckeye Game Fest where I tend to play different titles, or new ones, instead of concentrating on just a few. 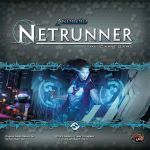 Android: Netrunner tops the list yet again, but with only 8 plays. I'm back to regular ANR gaming on Monday nights, with some other Fantasy Flight lcg games tossed in for variety. I imagine October will see ANR plays back to double digits. Dungeon Roll came in second with 5 plays. I think four of those were solo games where I had a few minutes to kill. 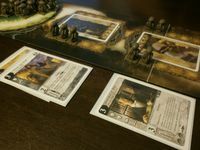 I got a great deal in the BGF math trade on a bundle of core sets and expansions for FFG's Lord of the Rings: The Card Game. Add in the Saga expansions to play through the Hobbit and trilogy, and my 4 plays this month should continue. Surprisingly, Pathfinder Adventure Card Game only had 4 plays. Not bad, since I didn't get my copy until mid-month. I'd just like to see it closer to double that amount of plays. 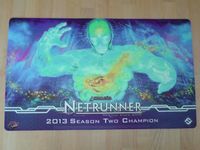 Android: Netrunner	98 - I believe this is a new record for me. It might be due to the Game Night Season Two Kit Tournament that we organized. Or due to me getting all the 1st Cycle expansions. Or just because.. and btw I hit 300 total plays today. There are some other interesting mentions here, but I'll talk about those in other topic - best new boardgame. 119 plays of 5 different games. Number of games goes down while play total remain in the same neighbourhood. Another month goes by without any new games . Didn't even add anything new to either of the top 2. Finally saw wins for the latest deck additions in Raw Deal, seems like it too a while and in terms of time, it was (playing each deck once per month sorta does that), but in terms of plays, fairly quickly. Continued to see what Dark City has to offer for Legendary and more and more I'm seeing that it is making the game easier, not particularly something that the game needs. Already have played more games with the expansion than with just the base game, but have more base game losses than with the expansion. Finished off the City character rotations for Talisman and even got around to updating my stats thread after a long break. Will see when the Talisman bug will bite again. Added Scoundrels of Skullport to LoW and naturally only played with both modules. More of the same, but with extra options that fit the theme nicely. Two all day-gaming days out this month, plus we hosted a weekend of Magic the Gathering (which always includes some other games, particularly party ones!) and a day of gaming with a friend who likes the lighter games, so it's been a good month for gaming! Also my preschooler spent the first week after my older two had gone back to school demanding games for several hours each day. All games listed I've played two or more times, or the list gets too long. Games played with adults listed in bold, those with my children not. Games new to me this month marked with a star. September was a much slower month for gaming than August. This was to be expected because with September comes school and many people in my gaming groups became too busy. Nonetheless I still managed to play 19 different games for a total of 30 plays. One a day average (but 9 happened on one day). 10 plays of 9 unique games.